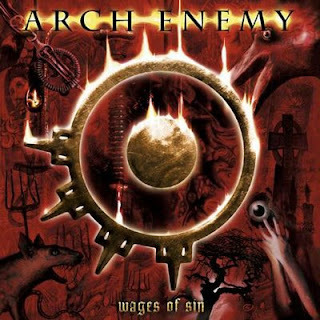 Hall of the Mountain King: Review: Arch Enemy, "Wages of Sin"
While the hard rock and metal arena has become more open to female performers over the past two decades, the more extreme end of the spectrum has still been pretty much an all-boys club - until now. When Arch Enemy vocalist Johan Liiva departed, the band raised some eyebrows by choosing a woman, Angela Gossow, as his replacement. In a press release, guitarist Michael Amott said the choice was a no-brainer. "She's really one in a million, musically, as well as visually," Amott said. On receiving their new album "Wages of Sin," my first thought was, "a death metal band with a female singer, that's a great gimmick." Then I popped the CD into the player. About halfway through the opening song "Enemy Within," my opinion changed. Gossow is the real deal. Not only does she kick the door down for women in extreme metal - she stomps that sucker into splinters and starts a raging bonfire with it. Brave Words & Bloody Knuckles, one of the leading metal magazines, said of Gossow, "Her performance is nothing short of staggering, giving many of her peers serious competition if not putting them to shame entirely." I can't disagree. Arch Enemy's sound could probably best be described as progressive death metal. That may sound like a contradiction until you hear how the ethereal opening lead and dark grinding verse of a song like "Shadows and Dust" work together. Musically, the band has more in common with early Dream Theater than Slayer, but Daniel Erlandsson's furious double-bass drumming and Gossow's feral snarls are pure death metal. Their arrangements are satisfyingly complex, but still unrelentingly heavy. Songs like "Heart of Darkness" and "Ravenous" are burners that show the incredible technical prowess of the band, but they're also shot through with intriguing, catchy melodies and musical hooks. Soft, but dark interludes - like the opening of "Enemy Within" and the instrumental cut "Snow Bound" - are sprinkled liberally throughout the album. The most interesting songs on "Wages of Sin" come when the band throws the listener a curve. "Savage Messiah" opens with a twangy lick that sounds like it came straight out of an old Western movie. The main riff of the song shows shades of early thrash, with an artsy chorus and a classic-sounding twin guitar lead break. Likewise, the groove of "Behind the Smile" seems a little out of place, but it works well. Even the obligatory death metal standards like "The First Deadly Sin" have melodic elements that set Arch Enemy apart from their peers. If you don't believe girls can play extreme metal, give "Wages of Sin" a listen. It just might change your mind.